As a community college closely associated with the Tohono O’odham Nation, TOCC encourages growth of students’ cultural knowledge and takes steps to transmit learning in a way that respects the Tohono O’odham Himdag. In addition to program requirements, TOCC has a Tohono O’odham Himdag requirement for graduation from any program of study. All students need to take two classes in Tohono O’odham culture: HIS 122 and THO 101 or THO 106. A Tohono O’odham language instructor may be the best person to assess whether the introductory class (THO 101) or the conversational class (THO 106) is appropriate for you. Depending upon the program of study, it may make sense to complete the TOCC Culture requirement with THO 101 or THO 106. In general, AAS degree-seeking students can fulfill requirements more quickly by taking THO 106, while a degree for transfer may fulfill different Gen. Ed. requirements with THO 101 than with THO 106. A student at TOCC will take HIS 122 to fulfill the TOCC Culture requirement, but the class can also meet one of the Arizona General Education categorical requirements. For example, HIS 122 is listed in the Humanities list, the Social and Behavioral Sciences list, as well as the International and Multicultural Studies part of the Other Requirements list. HIS 122 also meets all three Special Gen. Ed. requirements, and can be taken once to fulfill all three (I, G, C). Left to Right: Ron Geronimo, Juana Jose, Sylvia Hendricks, Pauline Nasewytewa and George Miguel. 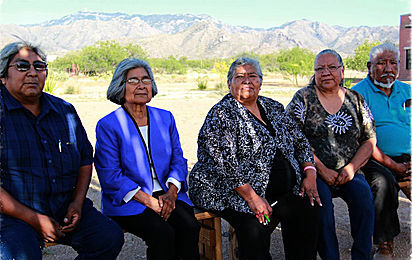 The Tohono O’odham Himdag Committee is a college-wide committee comprised of O’odham staff, faculty, students, and community members who meet to discuss various concerns, activities, and college policies. The committee works to incorporate himdag into every aspect of college life and strives to make the college more O’odham culturally sensitive.